Lola Nolan, who believes that "Life is too short to be the same person every day", loves wearing coloured wigs together with her own unique clothing styles. She was raised by her gay parents and has a rockstar boyfriend, Max, who is five years older than her. Lola's world turned upside down when their old neighbors, the Bell family, move back. 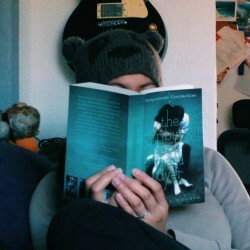 I love Anna and the French Kiss so much that's why I was so excited about the next novel, Lola and the Boy Next Door and since it's a companion book, we cannot avoid the comparison of the two and for me, I still love AanFK. Their appearance in this book made me love them even more. Just like with AatFK, I couldn't stop myself reading LatBND. I fell inlove easily with the characters. As always, Stephanie Perkins' characters are relatable and likeable. And that's what I love about her. I like it that Lola is being true in terms of expressing herself through clothings, like not wearing the same outfit twice, and I don't accept what Max told her about it. At first, I thought I will hate Max for being such a jerk but then I've realized that Lola did caused him to act like that and it's not because of their age difference. I'm a fan of "age doesn't matter" not because I'm two years older than my fiance but because love is a feeling and age is just a number. At first Max is like the perfect boyfriend who even attends Lola's family "Sunday brunch" even her gay parents are interrogating him and then all of the sudden he became an ahole boyfriend. 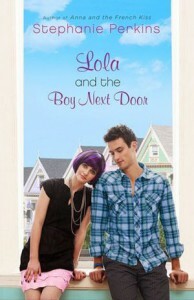 I just don't like how Lola and Max's relationship ends. Cricket. Is there really a guy nowadays who's like him? Got his fingernails painted Opening Night blue by a girl? He's just so perfect except of his name but it's quite appropriate for him. Though his presence is not enough (compared to St. Clair in AatFK) considering that he is one of the main characters, I still like how sweet and endearing he is. Another thing I love in the story are Lola's dads. They are so cool and so perfect for each other. I can understand why they're strict to Lola. And oh, for Filipino readers out there, Stephanie Perkins mentioned a "pudgy but muscled Filipino" guy in this book. The plot is fairly simple and the ending is predictable but these things didn't affect how I felt throughout the story. Good thing I've read this at home and not in public because people might think that I'm weird for smiling at my iPad.